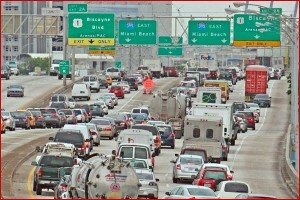 Recently, The Huffington Post crowned Miami home to the worst drivers in America. In the Miami-Dade County area, distracted drivers continue to contribute to the overwhelming number of traffic accidents that occur daily. Brian Palmer, a writer for Slate.com, “crunched the numbers” and found in 2012 Miami topped the national list for the highest amount of automobile fatalities and hit-and-run accidents involving pedestrians—on average 35 hit-and-run violations a day. Statistics showed Miami experienced more distracted driver accidents than any other city in America, with Philadelphia a distant runner-up. South Florida’s increasing problem of distracted drivers and texting sparked Governor Rick Scott to sign a texting ban in May, which will take effect October 1, 2013. The Florida Department of Transportation plans to sponsor a Distracted Driver Awareness Campaign. The awareness campaign will target teenagers. Governor Scott also emphasized the importance of The National Safety Council’s report that 3,000 teenagers end up receiving hospital treatment due to accidents involving texting. Distracted drivers and texting have become a national public dilemma. The Florida Department of Highway Safety and Motor Vehicles estimates that at least 189 collisions in 2012 involved texting. The Huffington Post stated that the behavior of texting while driving increases the chances of an automobile accident by 23 percent. Since 2006, many states have voted to pass texting bans, concerned with the rise of fatalities due to drivers texting behind the wheel. In a related Huffington Post article from August 2013, a Miami personal Injury attorney points out that a 2010 FDOT Internet survey indicated that 67 percent of the 1,297 respondents identified inattentive or distracted drivers as the biggest traffic safety concern. Florida’s new ban allows for “wiggle room” as drivers can still listen to the radio and use GPS on their cellphones. Florida law enforcement cannot cite motorists for texting as a primary violation but only as a “secondary violation” after law enforcement stops a driver for another violation, such as a broken tail light or an expired tag. Some motorists believe the texting ban will be difficult to prove and enforce. If you’ve been injured in a Miami vehicular accident as the result of someone’s carelessness, contact Wolfson Law Firm at 305-285-1115.